Propose a piece for Freshman Showcase! We can’t wait to read yours! One Flew Over the Cuckoo’s Nest TONIGHT! Ken Kesey was a creative writing fellow at Stanford University when he took a night job as an aide in a San Francisco mental hospital. His experiences in the hospital, as well as his participation in early medical experiments with psychedelic drugs inspired one of the great American novels of the twentieth century: One Flew Over the Cuckoo’s Nest. Kesey wrote his novel in 1962, at a turning point for the American counterculture. He took the disillusionment of the beat generation and mixed it with the ideas of “perception” that would dominate the drug and hippie culture of the late sixties. He filled his imaginary hospital ward with the outcasts of Biff Loman’s generation: men rejected by society for their inability to realize the American Dream. These men, like the patients Kesey saw in San Francisco, were less mentally ill than they were victims of a corrupt society which treated men like machines. Kesey’s work presents some critical problems for the modern audience. Both the original novel and Dale Wasserman’s 1963 stage adaptation present the story of the men’s self-realizations as a distinctly male process of reclaiming ‘manhood’ from the “ball-cutting” Nurse Ratched. We hope to downplay the play’s misogynist overtones by turning Dr. Spivey into a young, intelligent female doctor, focusing the show’s antagonism on Nurse Ratched rather than womanhood in general. Kesey’s buffoon-like African-American ‘aide’ characters, as well as the half-Indian Chief Bromden will be played with no intentional reference made to the ethnic stereotypes found in the source text. If nothing else, I hope this show keeps you entertained for a solid two hours. I also hope it leaves you with some food for thought, and inspires you to ask questions about an individual’s relationship with society, with God, and with themselves. Most importantly, I hope you appreciate the amount of time this devoted group of actors and production crew members took out of their busy college schedules to reproduce this classic American story. Tune in, turn on, drop out, and enjoy One Flew Over the Cuckoo’s Nest. Audition for Show of a Lifetime! 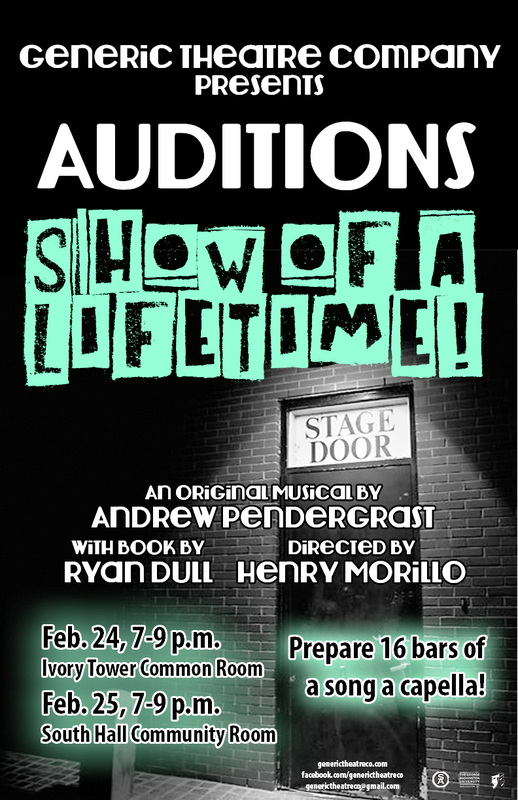 This weekend we have auditions for Generic’s only musical of the season, SHOW OF A LIFETIME! directed by Henry Morillo. This original piece, with music by Andrew Pendergrast and book by Ryan Dull, is seeking a large cast of characters so make sure you all come out this Sunday or Monday from 7-9 p.m. in the Ivory Tower and South Hall common rooms respectively. Check out the show’s website to learn more! Here is another update from Cuckoo’s director Michael Salgarolo! Our second week was our first walk-through of the show’s second act, which deals with some very light moments and some incredibly heavy ones. We see McMurphy and the men of the ward building friendships and learning from each other, but we also Nurse Ratched’s attempts to maintain order at all costs. Our cast is now in the nascent stages of developing their characters, and I loved talking to them about their backstories during character meetings last week. Rachel (Nurse Ratched), TJ (Chief), and Greg (Scanlon) have been exceptional in doing background research. 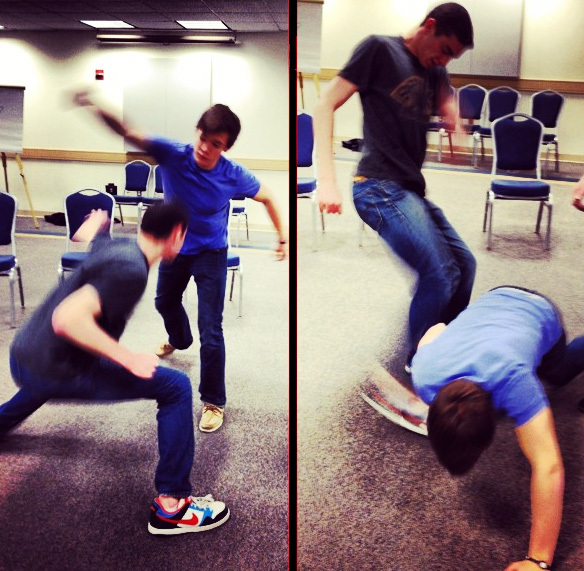 We’re getting a lot of work done at rehearsals, but having fun too. We give each other life updates at the start of every rehearsal. Typical comments include: “I didn’t sleep at all last night,” “I’ve been high on Percocet all day,” and “I bought pants yesterday.” We’re also constantly entertained by the colorful comments of our own Clay Miller (aka C-Millz). I’ve been searching for months for music and 1950s sound clips to use in our pre-show sequence, which I’ve started to share with our sound designer. I’m so excited to be working with Austin Keefe on this aspect of the production, which will help to set the show’s many moods. We’re finishing putting together a great team of designers for the set, lights, costumes, props, and hair and makeup. Looking forward to gettting everything together as our show dates approach. MALES PAY ATTENTION! 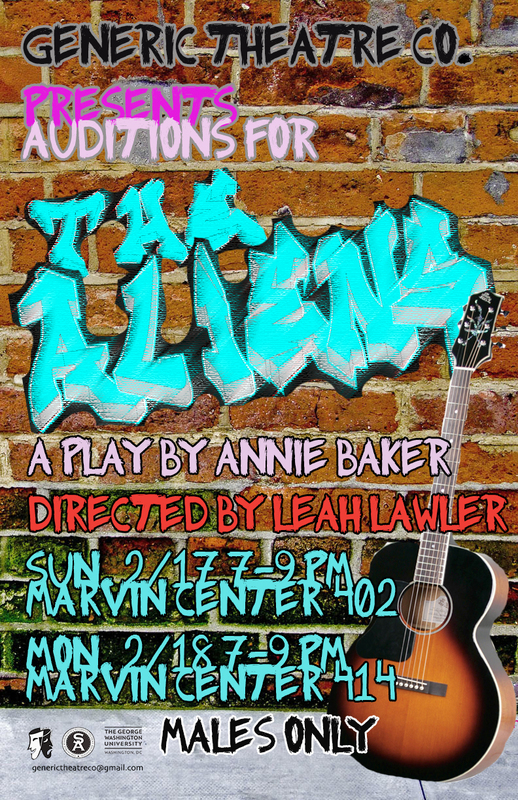 Make sure you come out and audition for our next show of the season The Aliens by Annie Baker directed by Leah Laweler. The show calls for three guys! We look forward to seeing you there! We are so excited to start rehearsing for Wit by Margaret Edson directed by Samantha Stone. Thanks to all of those who came out to audition! 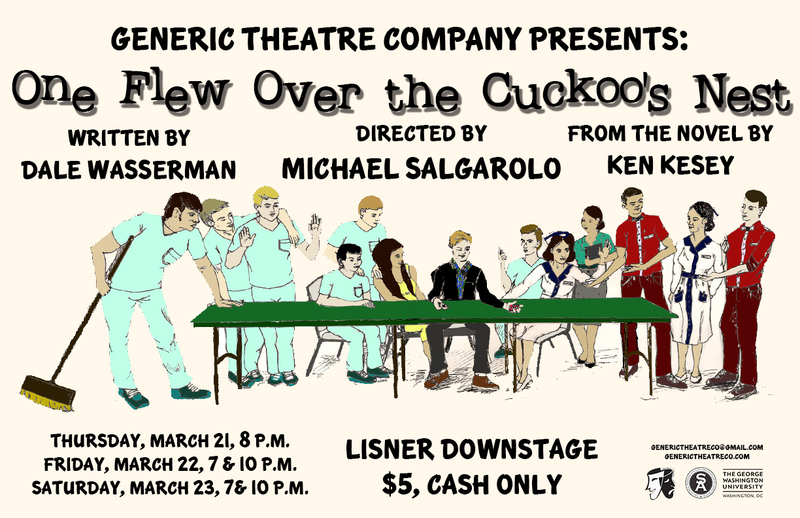 It has been one week into the rehearsals for Generic’s first show of the season One Flew Over the Cuckoo’s Nest, directed by Michael Salgarolo! It’s been a great first week of rehearsals for One Flew Over the Cuckoo’s Nest. We had a read-through on Sunday and have spent the first week blocking the first act. It’s been fun getting to know a wide variety of characters: the ones in the show AND the ones in the cast. We’ve also spent far too time reading the hilarious twitter feed of Aide Turkle. Be sure to follow our production twitter for rehearsal updates and show-related content! We will have more updates soon, and be sure to come out to auditions for the rest of our season! One Flew Over the Cuckoo’s Nest Cast! Thanks to everyone who came out to audition for One Flew Over the Cuckoo’s Nest directed by Michael Salgarolo! The show goes up on March 21, 22 and 23! 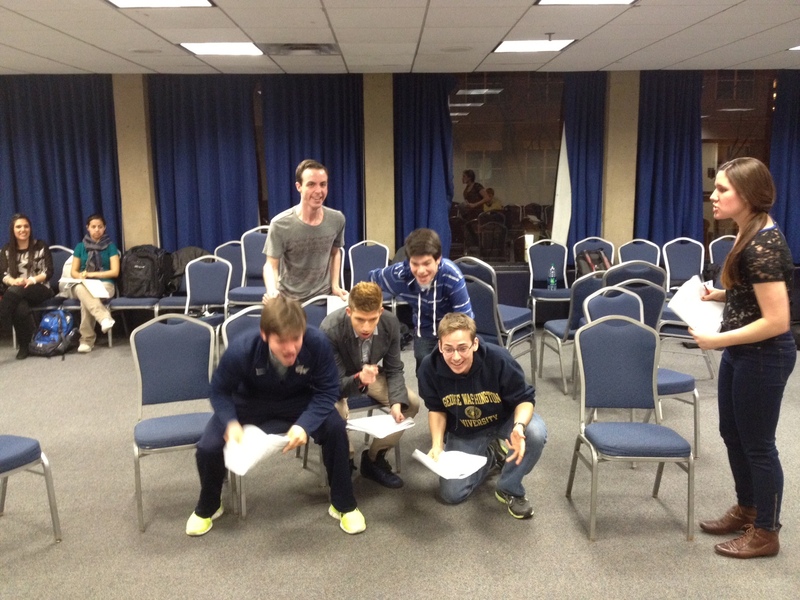 Check out the cast and crew at their first read-through! Welcome back Genericans! We hope you all join us tonight at our Spring Body Meeting tonight in the IVORY TOWER Common Room at 7 p.m. We will be discussing our Spring 2013 season as well as preparing for our annual 24-Hour Play! We can’t wait to see you all tonight! This weekend is Generic’s last show of the season Kander and Ebb’s Cabaret! Limited tickets are available for pre-sale online by clicking here. Tickets will also be available at the door for $5, cash only.